This entry has been a long time in gestation. Unlike Kevin, your webmaster, who goes out and makes a day trip to do an entry, I take pictures as I travel around to the different parts of our great city. That’s why I ALWAYS keep my Nikon in my bag. In traveling around and seeing possible things for FNY , I have to be ready. 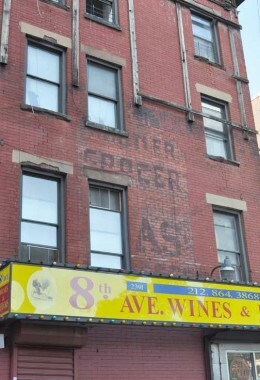 I’ve been a fan of old signs even before there was such a thing as FNY. Fortunately I’ve been able to capture these images before they disappear. As a matter of fact a few signs that I captured have disappeared due to new construction or changing demographics. In fact, I can predict that even more WILL disappear. Title card: Bergen Tile on Flatbush Avenue near Pacific Street, Prospect Heights, Brooklyn bit the dust an an ongoing concern only recently. I suspect weak sales (due to large stores like Home Depot and Lowe’s) ) and an increase in rent (in anticipation of the large crowds to come at the new Barclays Center basketball arena nearby) did it in. 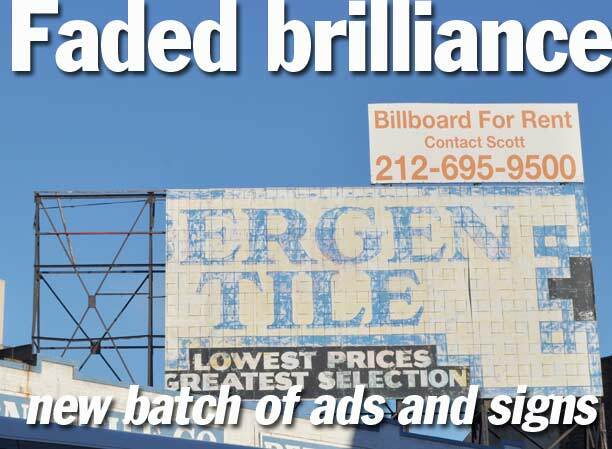 In fact, I made some purchases from Bergen Tile shortly before it shuttered. 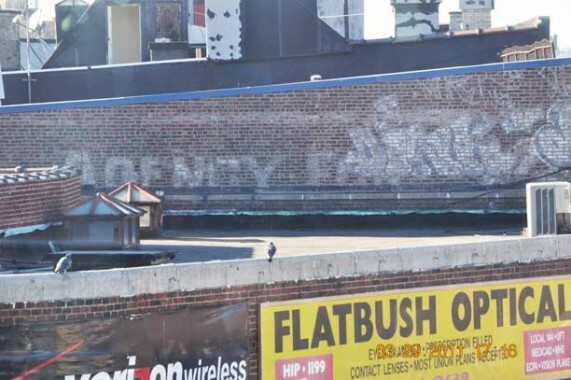 This may be a first for FNY, where the product or part of it that’s no longer produced is shown and is represented by old faded signs throughout the city. 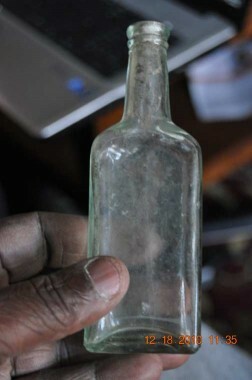 This Fletcher’s Castoria bottle is from my wife’s small bottle collection. 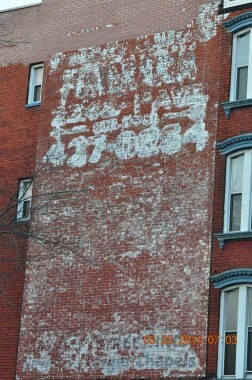 Fletcher’s Castoria advertised throughout the city. I thought FNY had captured them all over the years. 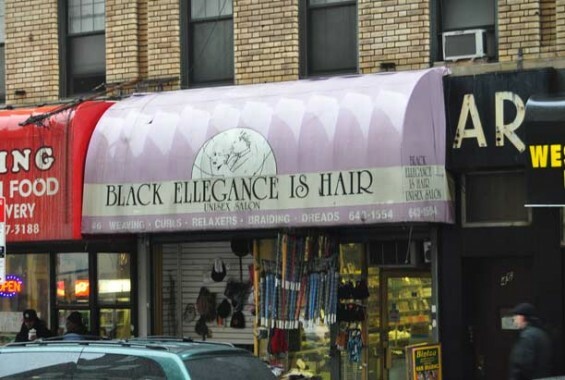 However, I passed this sign many times on Flatbush Avenue near State Street in Brooklyn. and never saw it until I went to an art sale in a park across the street. Fortunately I had my camera. J.L. Mott Iron Works, Bronx Side of the Third Avenue Bridge. This sign that’s easy to miss. If you drive across the Third Avenue Bridge, as many people do, including me, you’d NEVER see this sign. You’d only see it if you were walking or bicycling northbound on the Bronx side. 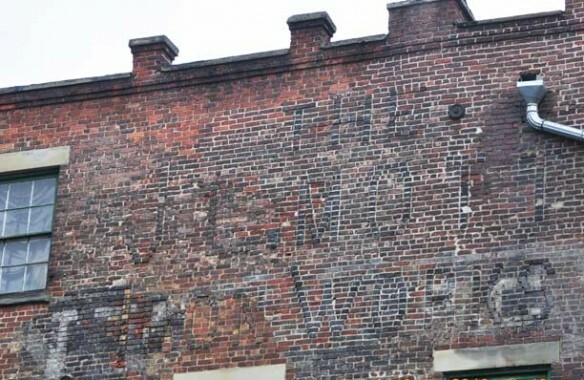 The J. L. Mott Iron Works was established by Jordan L. Mott in New York in the area now called Mott Haven [Bronx] in 1828; the business was continued by his son, J.L. Mott, Jr. The elder Mott specialised in the manufacture of cooking-stoves fueled with anthracite coal. 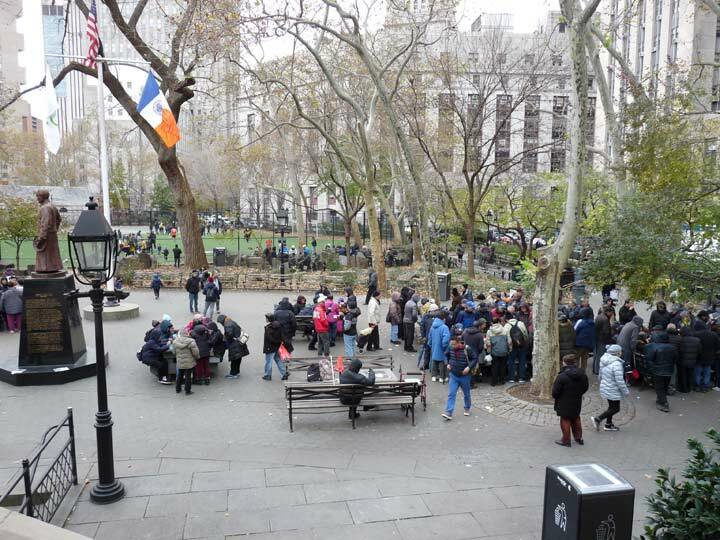 “Stoves and ranges, hot-air furnaces, parlor grates and fenders, fire irons, cauldrons and kettles, statuary, candelabra, fountains garden seats, vases, iron pipes or every kind, water tanks, &c” are mentioned in Benson John Lossing, History of New York City. Mott was interested in the patenting of inventions, but turned down President Buchanan‘s offer to make him Commissioner of Patents. At the Centennial Exposition in Philadelphia, 1876, an elaborate cast iron fountain, 25 feet tall, was exhibited by the company. According to the exposition review, Gems of the Centennial Exposition all of the modeling of architectural forms, basins and figures was completed by artisans of the company. Figures were molded in clay, then cast in plaster to provide the moulds for the cast iron, in a process similar to bronze-founding. The lowest “pan” or basin was ten feet in diameter, said at the time to have been the largest such cast-iron basin in the United States. Some examples of the fountain figure The Boy with the Leaking Boot in various American and Canadian cities were purchased from the company. 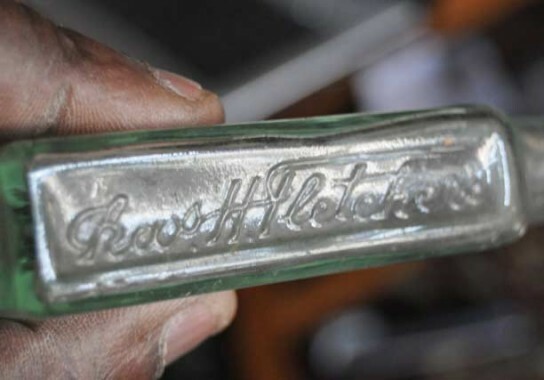 The company relocated in about 1902 to Trenton, New Jersey. A demolition exposed this ancient one on 3rd Avenue near 60th Street in Bay Ridge, Brooklyn. Having my Nikon in my backpack paid off this day. I was just sitting in the Target in Flatbush Junction, Brooklyn when I saw this sign that can’t be seen from street level. Unfortunately, graffitti has almost hidden this one. H-O Oatmeal at one time was a serious rival to Quaker Oats. 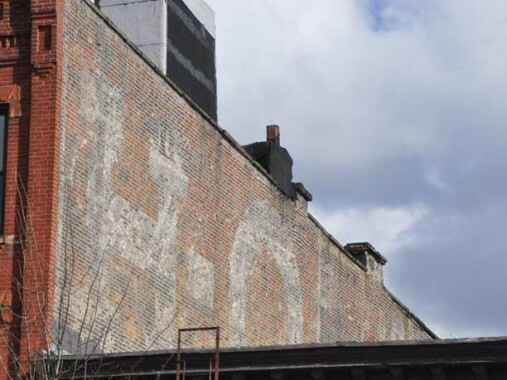 (H-O no longer exists for the general market.) Quaker is still around after all these years. Who would have thought that Quaker would be someday owned by a soft drink collosus (Pepsico). 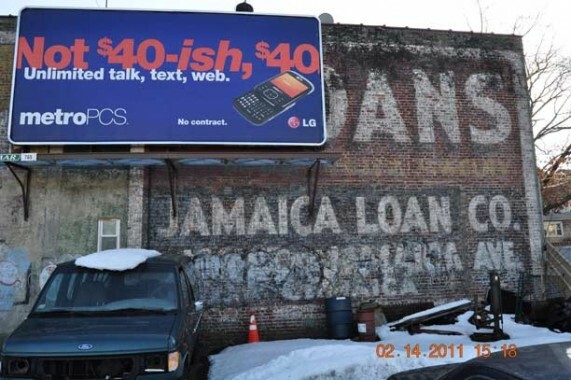 The construction of elevated lines influenced where advertisers places their ads. Placing ads strategically was made for a captive el riding audience. It’s on 5th between Sterling & St. John Places where this sign resides, directly across the street from the Key Food parking lot. [The 5th Avenue El ran here from the 1880s to 1940. -KW] I only saw it by accident when I had to drive around the rear of the lot and saw it. It’s impossible to see it from the street. Lucky for you FNY fans, I had my camera in my bag. Did the owners of this business think they could escape a FNY camera when it comes to finding an old neon sign on Hoyt Street between Livingston and Schermerhorn Streets in Downtown Brooklyn? Not hardly! Maybe it was a bar. 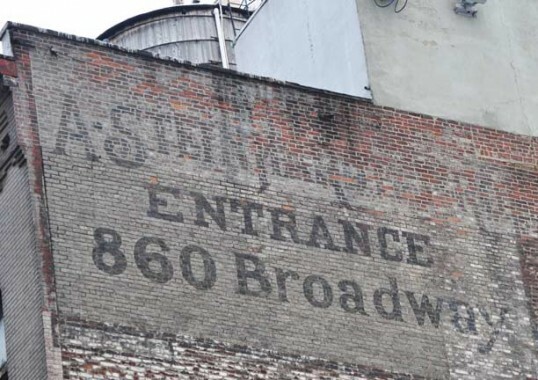 18th Street, east of Broadway is the location of this well preserved beauty. Walter Grutchfield: This is the 18th Street end of an L-shaped building with its main entrance on Broadway. 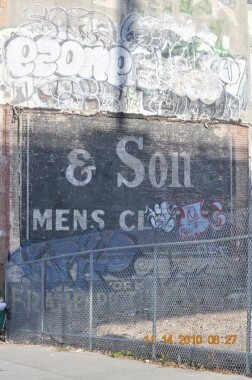 The sign refers to A. Steinhardt & Bro., importers, exporters and manufacturers of “fancy goods.” Fancy goods is a term still in use today that was much in use a century ago to refer to luxury items such as giftware, ornaments, fragrances, toys, dolls and god knows what all too diverse to fit any more specific term. Steinhardt was located in this building from around 1912 to 1921. The signs, then, must date from that period. 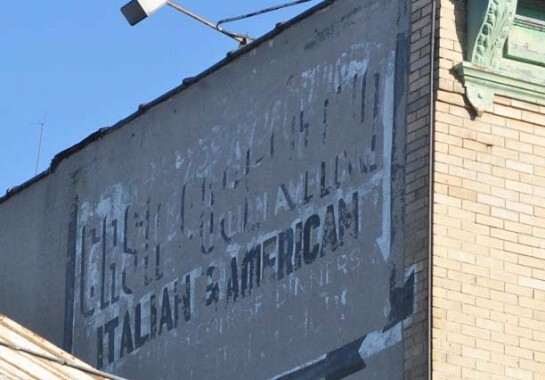 Near Westchester Square on Williamsbridge Road in the Bronx is this illegible Italian & American restaurant sign. Just east of Second Avenue near East 2nd Street in the East Village is this sign. 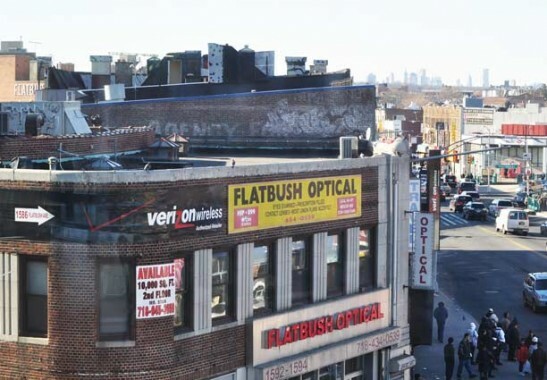 A grocery sign was revealed after another sign on top of it was removed at the NW corner of 127th & Frederick Douglass Boulevard (8th Ave) in Harlem. This is another example of a FNY camera being in action before the subject disappeared due to new construction. 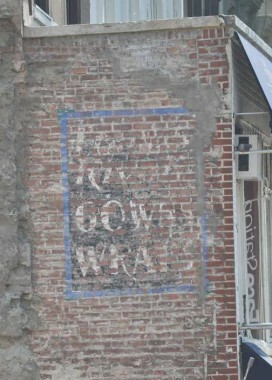 This sign was visible for a while after demolition and before construction of a new building on Lexington Avenue near 65th Street. I had to ask for permission to enter the this repair lot on Springfield Boulevard & 111th Avenue in Hollis, Queens. The owner seemed puzzled as to why I wanted to take a picture of some old sign. The lot contained this treasure. This huge billboard blocks the view of some sort of jewelry store ad in the same lot. Even though Oldsmobile was dropped by GM a few years ago, its name still exists here where it can be seen from the Bronx River Parkway near 238th Street in the Bronx. I don’t know what the heck happened to this sign on Second Avenue near 120th Street in Spanish Harlem, Manhattan. This one on First Avenue near 121st Street is VERY easy to miss. You won’t see it if you’re driving because you’d have to look in the opposite direction of your travel. You’d only see it if you were on foot. FNY Correspondent Gary Fonville was born in New Bern, NC on February 10, 1952 and entered the NYC Public Schools in 1958 but only attended for two years.He attended SUNY at New Paltz, graduating in 1975. After graduation, married wife Rebecca and worked in the educational field until 1982. In October, 1982 he began working for the NYCTA as a Bus Operator and worked in that capacity until October, 2003 when health issues forced him to be reclassified to the position as a TPPA (Transit Property Protection Agent). His new hobby, photography, came about by being a contributor to FNY and snapping many photos in the process. Thanks, Gary. I’m always pleased when Kevin features your work. 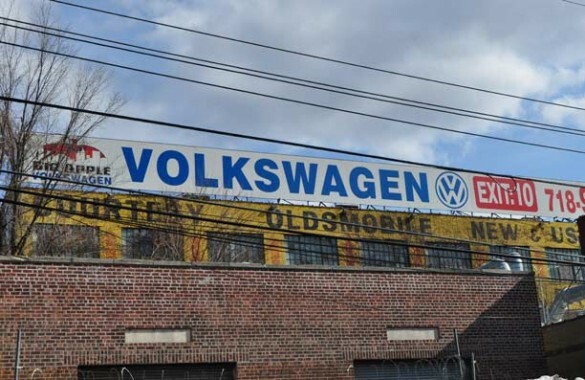 The Courtesy Oldmobile sign is only from the 70’s.The dealer was Linder Olds before that.They also had Linder Porsche/Audi which I worked at when I was attending Lehman College. Courtesy Olds was a pretty popular Bronx dealership in its day, probably on par with Bauley Oldsmobile outside of Parkchester, next to where the old DMV building remains. Bauley Olds (if that’s how it was spelled) was part of the East Bronx’s “Automobile Row,” which actually was further east on Tremont towards Westchester Square. 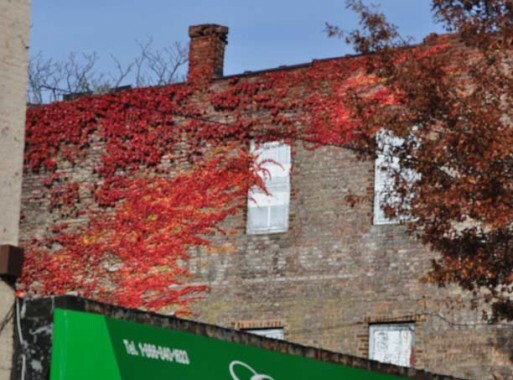 It consisted of a VERY popular Pape Chevrolet dealer, a Buick dealership, and maybe one more just east of Buick, and one just west of Pape. These dealerships, despite their proximity to each other, did very well, incorporating on the middle class residents of Parkchester, some of whom would religiously buy a new car every two years or so. Across the street from where the old DMV is there is, I believe, an insurance store, in which another early-1940s auto dealership existed. I believe in one of the editions of the “Back in the Bronx” books there’s a picture of it. There was also a Pontiac dealership much further west on Tremont, at White Plains Road (but not considered part of the “prestigious” Automobile Row!). 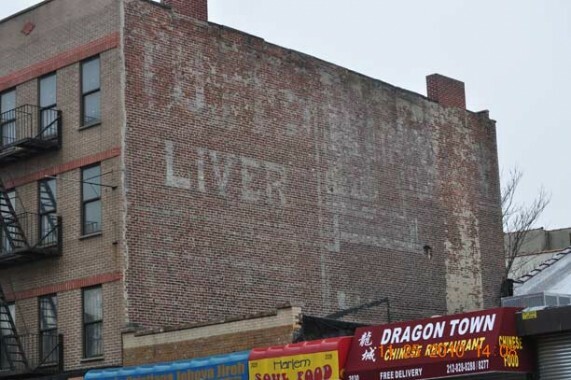 I haven’t had a chance to get a picture of it, but there’s an interesting painted sign on 16th avenue near 47th street in Boro Park, advertising an antique store that no longer exists. It’s at ground level and is partly obscured by the porch of the house next door. if he is part of your family. Love it. 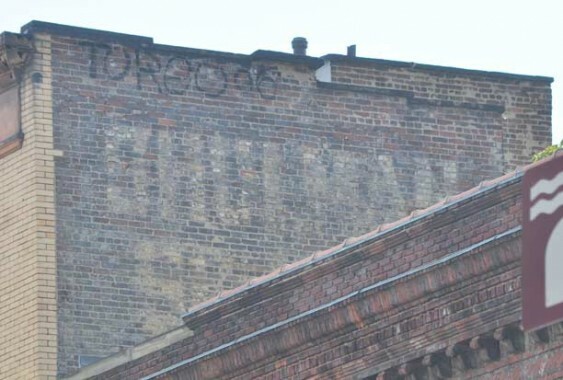 I look for ghost signs everywhere and am always a bit worried that there will suddenly be none left in the world. This shows me that I’m not quite right, at least, not yet. J.L. Mott also made Duchamp’s urinal (he signed it “R. Mutt,” probably a play on the name). Bergen Tile simply moved to further out on Long Island. But I have no idea what happened to Brooklyn Tile, once on 4th Ave., which was always my choice for their selection of tiles to match older decors. Thanks for all your great work! I love everything this website does! Thanks for your latest set, Gary. 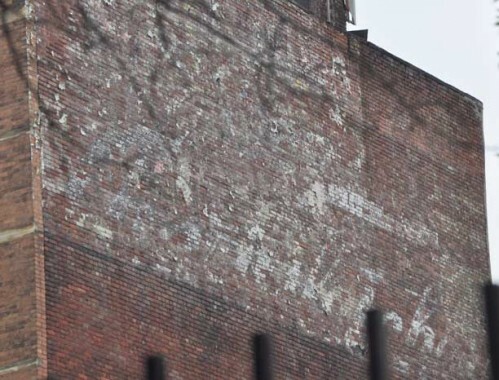 I have to admit, that some of these I do see, but never actually notice, though I do know about that Oldsmobile ad everytime I go southbound on the Bronx River Parkway. 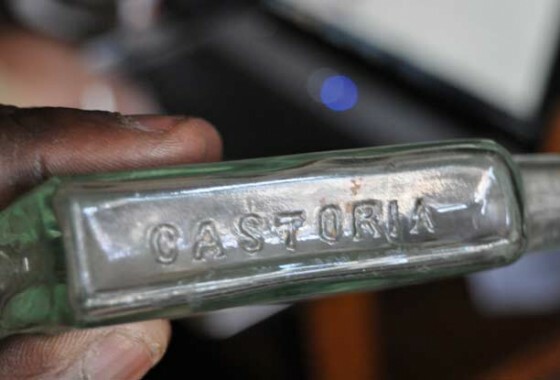 Just for a thought, does Fletcher’s Castoria still exist today, or was that stopped a long time ago? 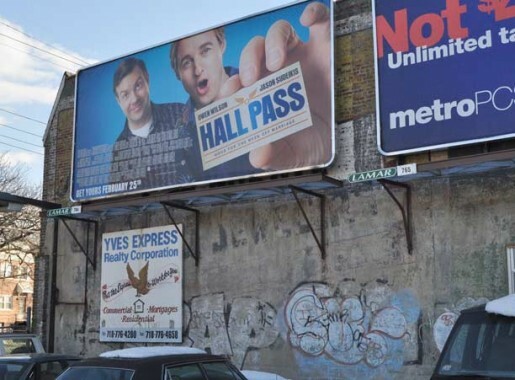 Of course for the rest of the ads, I can imagine that some of them are hidden, which is no surprise here. Haha! Berroci my thoughts exactly! Duchamp!